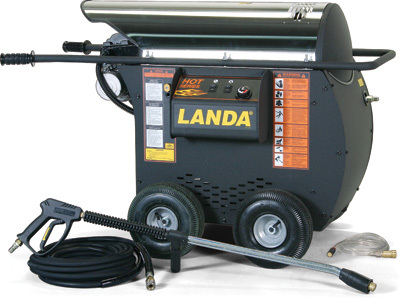 Electric-Powered/Diesel/Oil Heated Pressure Washer. The most economical choice of LANDA’s line. Heavy-duty Legacy or Baldor Motor with Landa High-Pressure Pump, which features three ceramic plungers and a forged brass head with 7‑year warranty. High-heat aluminized steel inner wrap surrounds coldrolled Heating Coil made of Schedule 80 steel pipe with five-year warranty. High-efficiency Burner is protected by a cover and mounted on the end for easy access.